Online Halloween costume retailer People Are Costumes came under fire this past week for selling full-body jumpsuits with big, bulb-shaped alien heads, calling the product Martian Madness. The costumes were apparently based on several fictional depictions of Martians. A social media campaign spearheaded by crowds of science fiction nerds quickly overtook Twitter timelines and Reddit threads as people expressed their outrage and disappointment in People Are Costumes, calling out the company for being “tone deaf” about the current political climate. People Are Costumes responded to the criticism by the weekend in a 12-part Twitter thread that served as a company press release. This calmed much of the outrage, though there were some who pointed out that the costumes that stereotyped real actual human beings might be a far greater cause for concern than the fictional Martian costumes. “Oh, sorry, we meant ‘Native American’ Princess Deluxe—our apologies,” the company amended on Twitter. Activists with vast, endless wells of patience continued to speak out against the company, carefully explaining that treating other peoples’ cultures as costumes is directly harmful and upholds racist stereotypes that persist to this day. 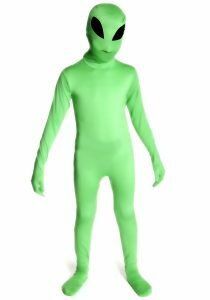 Unfortunately, many of those who critiqued the company for selling the Martian costumes seemed unwilling to take up the cause. People Are Costumes stated in a further Twitter press release that to honour the repeated requests to take down the racist caricature costumes, they plan to expand the costume lines.